Eyes Down Bingo is no longer endorsed by bingogals. Please check our UK Bingo Reviews for our favorite UK bingo sites. Eyes Down offers a jam packed bingo schedule in all of their online bingo rooms as well as great deposit bonuses and a loyalty program for all their members who continue to play online bingo at their site. Eyes Down Bingo offers £10 no deposit bingo bonus to test drive their games and 200% first deposit bonus on deposits over £10. EyesDown offers a regular deposit bonus of up to 250% depending on your point level. EyesDown.com has several different progressive jackpots in Big Ticket, Sky High and Fast Cash 75. Eyes Down Bingo offers bingo games in 75 balls as well as 90 balls. Eyes Down Bingo has an Ultra Loyalty Club where you can earn points and grab higher deposit bonuses. 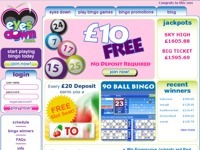 EyesDown Bingo Referral Rewards they offer 15% bonus points on every deposit made by your friends for life. EyesDown.com offers e-mail . toll free and help desk support. Eyes Down Bingo offers a several Deposit and Payout Options including: Visa, Mastercard, Neteller, Ukash, Solo, Visa Electron and Maestro. Eyes Down Bingo has slightly above average site graphics. EyesDownBingo is run on Parlay Software. They are one of the pioneers of online software and have all the features, including security that you will need to play online bingo. The Overall Rating from our Eyes Down Review is 9.0 which is one of our top rated bingo sites. The free trial of £1, sign-up bonus and deposit bonuses could all be improved (this has now been upgraded to £10), but all in all this is a great bingo site with great support. Get ready for some great bingo action and start off with a 200% Signup Bonus EyesDown.com. This is an awesome site if you are looking for friendly chat moderators. Meet new friends as you have fun playing bingo at Eyes Down. Watch the famous birthdays march past you each day from July 15th to July 21st in Eyes Down Bingo Parade of the Stars for your chance to win a bonus present. Play daily online bingo games at Eyes Down Bingo and join the bingo quest draw for your chance to share £400 in prizes from August 13th to August 19th. Play online games bingo at Eyes Down Bingo and take part in the Trolling for Treasure contest on October 17th for your chance to be one of three winners of £100 cash. Keep warm this weekend by playing online games bingo at Eyes Down Bingo for some cold hard cash. Be the top bingo and slot player and you could share £700 in cash. From 14 to 20 January Eyes Down Bingo has some exciting new winter themed games to help keep you warm this time of year. Walk through the Winter Wonderland of cool cash and bonuses. Grand Prix is an hour of speed bingo featuring 90 number games (1 Line) and 80 number games (Big X and Full House). Join in for your prizes at Eyes Down Bingo. Which game will you win first: the chick or the egg? In the Eyes Down Bingo new Chicks ‘n Eggs £5000 Challenge it doesn’t matter which comes first, just make sure you win both of them! We’re in the final stages of the Eyes Down Bingo Tour de France £5000 Challenge! The F1 Racing season is half over, it’s time to rev up your engines and give the Eyes Down Bingo latest Challenge all you’ve got! Make deposits and play online games bingo at Eyes Down Bingo. Play £10 worth of bingo anytime on Thursday and receive £1 bonus free. Play online games bingo at Eyes Down Bingo and be one of the 11 bingo winner, you could have the chance to win a share of £1111 cash. That’s £101 for each winner. Rev up your engines for the Grand Prix Season Tournament! Eyes Down Bingo famous Grand Prix bingo games take pole-position in a special two week event for £750 in CASH prizes! Make deposits and play online games bingo at Eyes Down Bingo between November 11th and November 24th and take part in Hello-Hello £5000 Charlenge, you could win a share of £5000 prizes.